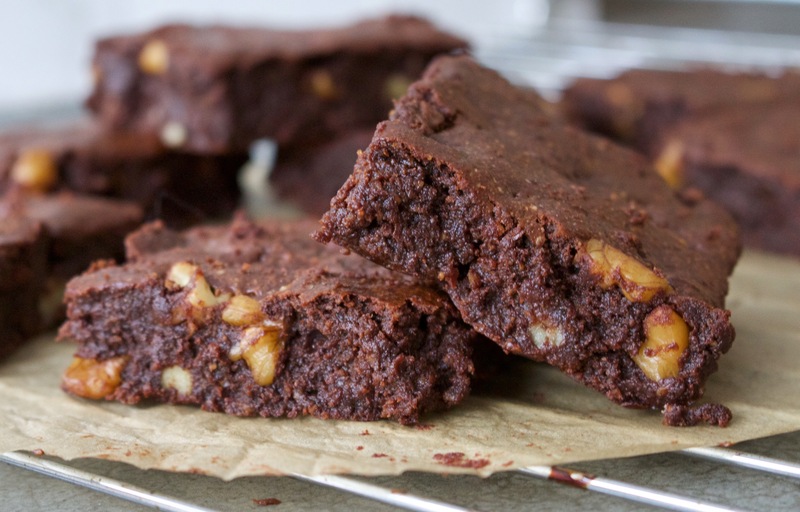 Brownies can be a tricky thing to get right, especially if you’re angling for the accolade of world’s best brownies, which I most certainly am (and which I believe these most certainly are). You need to get them to be ever so slightly crisp on top, chewy on the outsides and soft and gooey in the middle. It’s taken a lot of batches and a lot of taste testing (shout outs to Mr H and to my lovely family for being my ever willing guinea pigs) but one Saturday morning while Mr H was out at rugby, baby H was having her morning nap so I decided to try one more variation on my ever changing recipe and by gosh did I bloody nail it. I knew it as soon as they came out the oven. I could hardly wait for them to cool down. I was so sure that these would be perfect. After a lot of clock watching I deemed them cool enough to dig into and my oh my did they not disappoint. No siree. 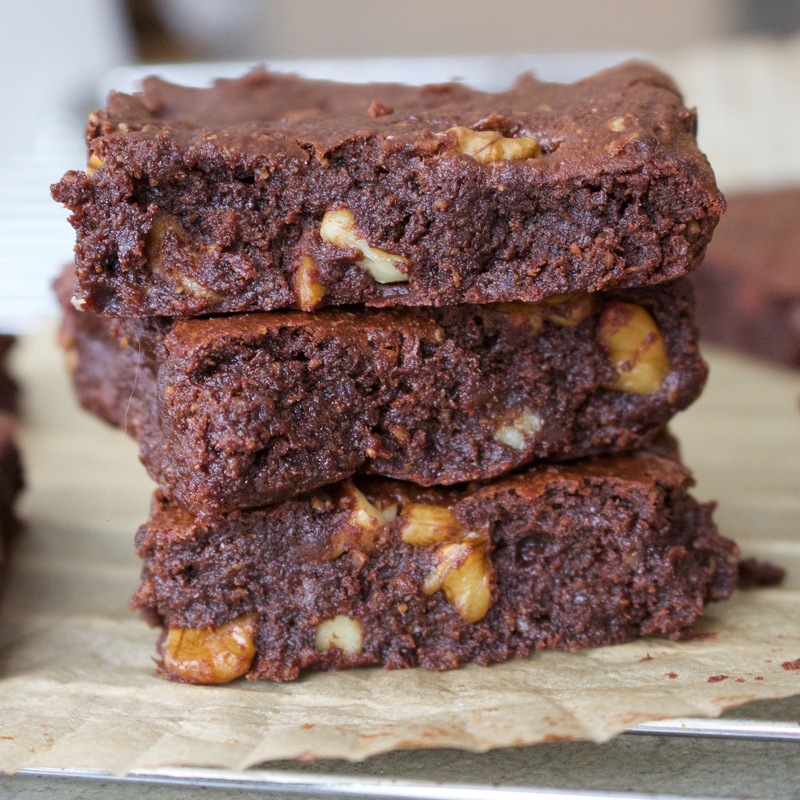 These brownies beat any unhealthy brownie I’ve EVER had in both taste and texture. You would never ever guess that they’re free from gluten, dairy and refined sugar and I’m so confident in their amazingness I urge you to stop what you’re doing, go buy the ingredients and make them. That is unless you’re at work or something but if that’s the case just make them ASAP. I promise, they will not disappoint. Start by preheating your oven to 150 degrees, then pop all the ingredients except the walnuts into a food processor and blend for a couple of minutes until a smooth and sticky batter forms. If it’s too sticky (i.e. it forms a big ball), just add in a little more water a tablespoon at a time until you get the desired consistency. Crumble the walnuts into the bowl and stir in, then spoon the batter into a lined baking tin or mould and press down with a spoon to make sure it’s all nice and even. Place in the oven and bake for 30 minutes, then leave for another half an hour to cool (as the brownies will continue to cook after they are taken out the oven). Then, when the waiting is finally over, cut into squares and enjoy! I thought these were amazing! My favourite recipe yet. So chocolatey.